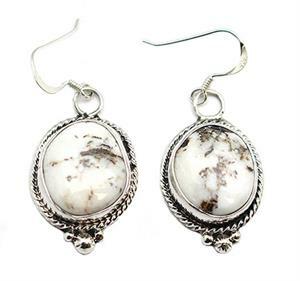 Natural free form white buffalo stone set in sterling silver bezel, twist wire border and drops. It measures approximately 1 5/8" long including sterling silver french wires by 3/4" wide. It is Navajo hand made by Alice Johnson. Color shade, shape and size of stone will vary.